It was an early start as Tamara and I sat on the bus heading to my allotment. It's been a beautiful day of sunshine. Sadly I forgot to put any cream on so I'm writing this while looking very much like a tomato which hasn't been picked after a few days of hot weather. 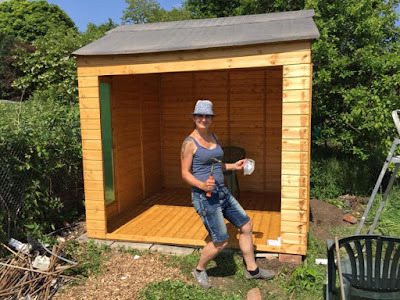 Today was the big project, the erecting of my first allotment shed on this site and as Tamara has had quite a bit of experience in building sheds over the years, she was keen to share a hand and very thankful I was too. With the sun on our backs and plenty of water on standby, plus Tamara's very own homemade lemon cordial and very refreshing it was too, we set about the job in front of us. "This Waltons Wooden Summerhouse boasts a bright, open plan space which is perfect for entertaining and relaxing. Made from high quality materials, this garden summerhouse will look great in any style of garden." 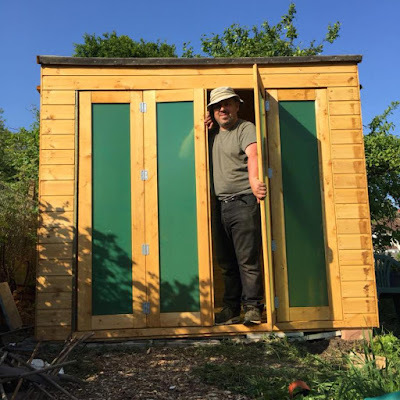 We were very exhausted by the end of the day and I must thank fellow plot holder Sergio who also lent a hand putting the roof on. It's good to have a tall person on an allotment site. I still need to remove the protective green layer from the windows and fix the lock on but that can be done on another, more cooler day. 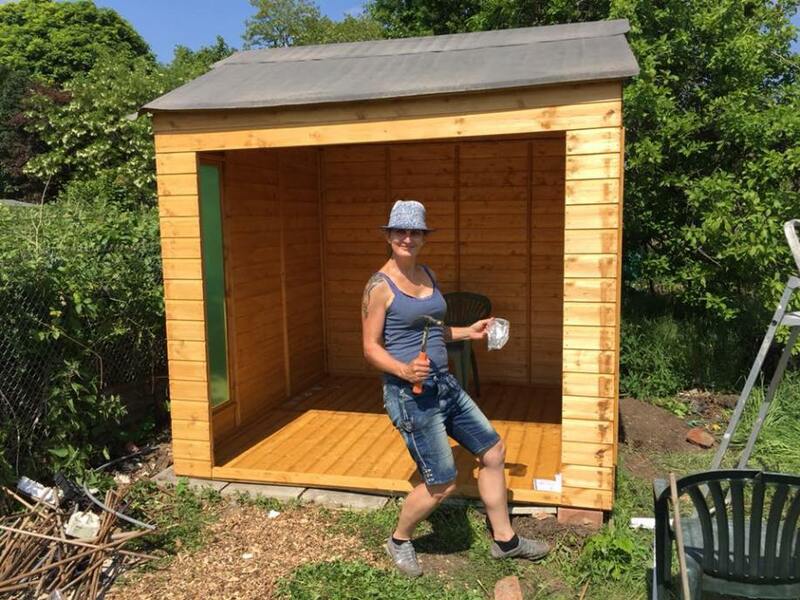 I love my new shed, ok summerhouse. As my allotment is quite far from home I will make good use of the space. A place to relax, cook, spend time with friends, watch the wildlife and plan the growing season in front of me. Maybe it's just me but I need to get my shed space sorted out first then I feel at home to face the coming months. We ended the day with a beautiful Sunday lunch in the local pub and when I got home I had a very big cuppa tea.